Paolo Crepaz and Lucia Castelli, physical education teacher and psychopedagogist for the football team Atalanta, participated as speakers in the international congress held in Esmeraldas in mid October 2010. The congress saw the participation of white and black trainers, teachers and sports managers, as well as of sports people coming from various local ethnic groups. They spent five days reflecting, discussing and playing on the topics of fraternity within sports, of education through games and sports, of being proactive citizens, of positive competitiveness. The weight-lifting Pan-American champion Seledina Nieves, Ecuador’s athlete of the year (and 6th at the world championships) also participated, giving her contribution. The event was marked by the thirst for knowledge and the extraordinary humanity of Ecuadorean people. The United Nations and the Andean Development Cooperation developed a programme for South America. 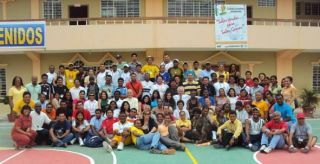 For Ecuador Fundacion Amiga was chosen as a model for human and social promotion through sports. And Fundacion Amiga has chosen Sportmeet as its educational agency. The project’s results will be presented at the Football Championships in Brazil in 2014. Nine out of the ten projects, each involving one South American Country, will be carried out by Right to Play (a Canadian NGO cooperating with the UN in the field of social sports projects) and one by Sportmeet! Besides the educational activities carried out by local experts, within the next two years Sportmeet shall promote four seminars organized by its own teachers, as well as some online lectures. It will of course also provide the educational material. Sportmeet feels honoured to be able to cooperate with Fundacion Amiga, and this project will be a crucial and very useful experimental lab of fraternity within sports.